In Chinese there are many words for the Chinese language, each with slightly different connotations. zhōng wén is perhaps the best word for general usage. zhōng中 means “middle” and is used to refer to China, “the middle kingdom”. wén文 can mean literature or writing. 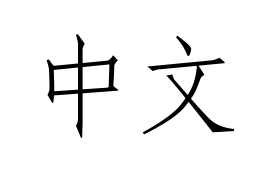 zhōng wén therefore technically refers to the written form of the Chinese language, but in spoken Chinese this technicality is often ignored and zhōng wén can be used freely to refer to written and spoken Chinese. Perhaps the next most common is hàn yǔ. hàn means the ethnic Chinese, as opposed to Chinese nationals who might be of a different ethnicity, such as Tibetan or Mongolian. yǔ means language, so hàn yǔ means the language of the Han Chinese, as opposed to the languages of other Chinese minority groups. For a beginner I would avoid using hàn yǔ until you are confident about your pronunciation, as it sounds very similar to hán yǔ (the Korean language). I remember once telling a confused taxi driver that I had come to Shanghai to study Korean. zhōng guó huà is particularly common in spoken Chinese. zhōng guó means “middle kingdom” (China) and huà means “speak”. You should be able to infer from this that zhōng guó huà means the spoken form of the language. If you were to say you are learning zhōng guó huà it would imply you are learning to speak a bit of the language but not necessarily learning to write it. pǔ tōng huà is Mandarin Chinese. pǔ tōng means “standard” and “huà ” again means speak. pǔ tōng huà is used to emphasise that you mean correct standard Chinese pronunciation. If you say you are studying pǔ tōng huà it would mean that you are just learning correct Mandarin pronunciation, and probably imply that you can already speak a different Chinese dialect, such as Cantonese. huà (speak) can be added to place names to indicate the accents or dialects of those places. Shàng hǎi huà means the Shanghai dialect, wǔ hàn huà means the Wuhan dialect, běi jīng huà the Beijing dialect, and so on. To summarise, there are several different words for Chinese, and once you start getting the hang of the language you will know which one best fits the context of what you want to say. But for the beginner I would suggest sticking with zhōng wén as a general term and you can’t go wrong.